Candidate Toni Preckwinkle speaks with moderator Laura Washington and a panel of experts at Wednesday's forum, held in the Logan Center. Mayoral candidates Lori Lightfoot and Toni Preckwinkle debated the fate of police superintendent Eddie Johnson regarding his handling of the Laquan McDonald shooting, and other issues pertaining to the Chicago Police Department (CPD) at the Chicago Public Safety Forum, held on campus on Wednesday. Lightfoot and opponent Toni Preckwinkle took the stage at the Logan Center for the Arts for the event, which was cohosted by the Institute of Politics, the Harris School of Public Policy, and the University of Chicago Crime Lab. Chicago Sun-Times columnist Laura Washington moderated the forum for the two candidates as they appeared separately for back-to-back 45-minute segments. Both candidates brought up the importance of rapidly implementing the Chicago Police Consent Decree, a binding document that mandates preventative measures against civil rights violations, like increased officer training and independent oversight. The Illinois Attorney General’s office drafted the decree after a Justice Department investigation revealed civil rights violations by the CPD. A federal judge approved it in January. Preckwinkle didn’t mention the recent scandals, such as the Laquan McDonald case, that have implicated CPD other than to stress the need for systemic change within the police department. However, Lightfoot emphasized her priority as mayor would be to support the CPD as it prepares for anticipated summer violence, rather than dismantle its leadership. “One of the questions and narratives that’s been part of this campaign is ‘what about Eddie Johnson? What are you going to do?’ And I’ve resisted frankly pandering to the crowd because the police department obviously needs to stay on its mission of serving and protecting us,” Lightfoot said. “So I do not believe that it’s appropriate to be talking about Eddie Johnson’s fate when all those things [lie] before us and they have to stay focused on their mission.” Preckwinkle had previously promised to fire Johnson over the cover-up that took place surrounding the shooting of Laquan McDonald. In the opening remarks, Crime Lab director Jens Ludwig emphasized that pervasive gun violence is a potential threat to Chicago’s future since it drives depopulation. 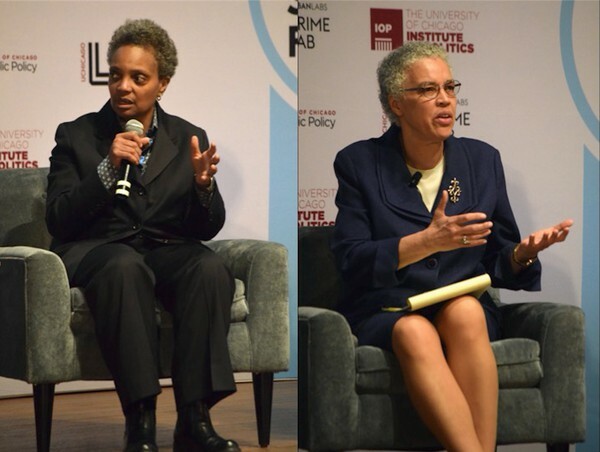 Afterward, three experts on crime and public safety questioned Lightfoot and then Preckwinkle on issues ranging from police reform to poverty. The experts were Liz Dozier, CEO of social impact investment company Chicago Beyond, journalist and documentarian Alex Kotlowitz, and former Philadelphia and Washington, D.C. police commissioner Charles Ramsey. A panel questioned Lightfoot and then Preckwinkle in separate 45-minute segments on issues from police reform to poverty. In response to a question about the high suicide rate among Chicago police officers, Lightfoot also declared her support for more resources for officer wellness. She cited a peer assistance program as a possible initiative, explaining that a greater investment in officer well-being would lead to better policing. Lightfoot and Preckwinkle both discussed the importance of creating trust between communities and the officers who police them, and of giving neighborhood residents a voice in public safety decisions that affect them. Preckwinkle mentioned expanding and diversifying the detective corps as ways to do this, as well as reinvesting in community policing. Although both candidates emphasized the need for more and improved police training, as well as a new training facility, each expressed reservations about outgoing mayor Rahm Emanuel’s plan to build a new police academy in West Garfield Park. City Council voted to approve a construction contract for the academy earlier on Wednesday. Preckwinkle questioned the proposed $95 million price tag for the academy, while Lightfoot pointed out that the plan had been made without proper community consultation. Lightfoot and Preckwinkle also agreed that the mayoral Office of Public Safety should be expanded, and that there should be more people to help coordinate resources between departments whose public safety duties might intersect, such as those of the CPD and Chicago Public Schools. The conversation later turned to the root causes of Chicago’s gun violence epidemic. Preckwinkle cited Chicago’s unique levels of racial segregation and its link to poverty as one reason for the violence. Lightfoot touched on the relationship between poverty and violence as well. Preckwinkle pointed to the dearth of investment in Chicago’s youth as a factor in producing crime, stressing that access to education and economic opportunity decreases violence.